Swimming is a great way of improving cardiovascular fitness, with constant moving allowing for blood and oxygen to be pumped more efficiently. Unlike sports such as football, rugby and golf, swimming does not strain your joints by having you expend energy and then rest. It also uses upper and lower body muscles at the same time, which could benefit people with diabetic neuropathy, who suffer from numbness. 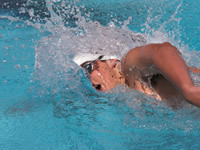 Intensity will vary, depending on your motivation for swimming, but per hour it can burn 350-420 calories and caution should be taken for beginners as hypoglycemic attacks can occur without proper preparation. Gary Hall Jr, a five-time Olympic gold medallist, was diagnosed with type 1 diabetes in 1999. His 50m time of 21.76 seconds set a new American record at the 2000 U.S. Olympic Trials. In 1996, Scott Coleman became the first insulin-dependent diabetic to cross the English Channel at the age of 42. Swimming can require dedicated management for people with diabetes who are insulin-dependent. Please note the following advice may not be appropriate for people on other medications. Swimming once or twice a week should not require excessive management, depending on how many lengths you swim per session. Keeping your blood sugar level above 12 mmol/l is necessary, however long you are planning to swim, as blood sugars lower than this can lead to early hypos. If your blood sugar is lower, consuming glucose tablets or several sips of a glucose drink can provide you with a necessary sugar boost. When your session is finished, consume more sugar immediately and a big meal later on to prevent hypos further in the day. People at risk of hypoglycemia looking to take up swimming on a regular basis are urged to see their doctor beforehand to assess their current health state and outline initial goals. If you are unfamiliar with consistent swimming, the intensity of an hour-long session can lead to hypos during and after a session. For this reason, it is unadvised for beginners to swim alone, especially if you cannot identify symptoms of high and low blood sugars. Once you have found a routine that works for you, and feel confident managing your diabetes, you can eventually start swimming on your own. Whether professionally, training for an event or to improve fitness, regular swimming will require frequent blood testing and keeping plenty of glucose on you at all times. Training days can require reductions of quick acting insulin and long lasting insulin , whereas match days, such as a marathon open water events, may require you to consult your doctor see how much insulin you could decrease your injections by. When training, glucose should be consumed every 30 minutes, but this may not be possible when performing in a race with a set time or distance that lasts longer. This is why for longer, intense events, a more dramatic decrease in insulin could be necessary in the build-up to the event. You should also never swim without medical identification if you are at risk of suffering hypos. Keeping something worn around your wrist is the best way of establishing that you have diabetes should you require help in the water. Protective footwear should also be worn if you are planning to swim in the ocean, where rocks or broken shells could cut your feet and potentially cause complications. Swimming with an insulin pump can be done with certain waterproof pumps, although you should not swim wearing your pump unless you know it is suitable for swimming. Most insulin pumps cannot be used for diving or swimming deep under the surface and will have to be disconnected beforehand. What does the diabetes community say about swimming? Members of the Diabetes Forum have previously asked questions about swimming and the energy it consumes. Member dickgarrard, asked: “I swim between 80 and 100 lengths and find that I run out of energy during the swim and want to get some extra energy from something, what do you suggest?"